The biggest event of 2012 is now the biggest miniseries of 2013! We all know what happened to the Avengers and the X-Men… but what if the story had gone differently? The one and only Jimmy Palmiotti brings his signature style to a mind-blowing reinterpretation of a key event in the history of the Marvel Universe. Featuring Magneto, Hope, and every Avenger and X-Man you can imagine! 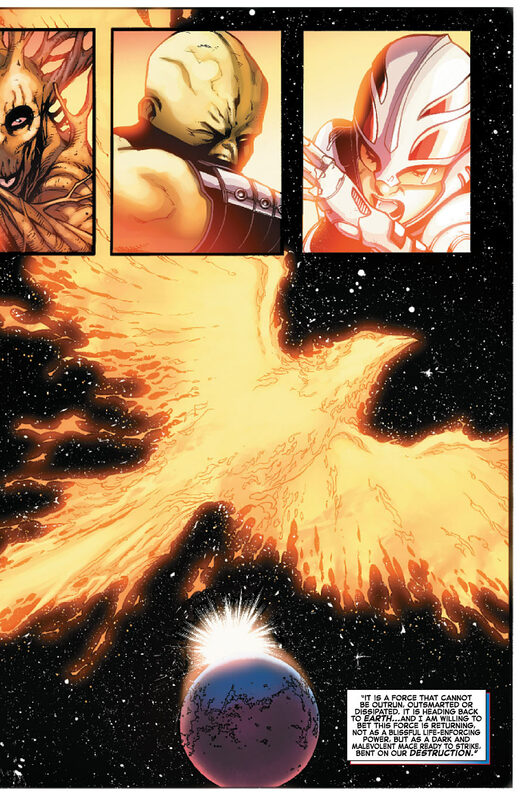 The guardians of the Galaxy are destroyed by the Phoenix Force as it heads to Earth. Black Panther, Nova, Thor, Vision and Ms. Marvel are sent into space to intercept. On Earth the Avengers lead by Captain America prepare to head to Utopia island home of the X-men. On Utopia Magneto is training Hope when the Avengers arrive. Tensions mount and Storm attempts to quell tempers unsuccessfully. Wolverine accidentally kills Storm as she defends Namor this causes Magneto to lose his $hit and destroy the SHIELD hellicarier. Cover- I like the cover with the X-men and Avengers facing off on the left and the right while Magneto holds Hope in the center with the Phoenix force blares in the background. Take 2- I always like these “what if?” tales and considering how controversial some elements of the original tale were I’m curious which avenue Palmiotti is taking this. Art- Not a great as what we had in Avengers Vs X-men but pretty decent since it handles the action and slower scenes well. Action- Avengers Vs X-men had great action that you really can’t complain about and this what if tale doesn’t live up to the original but delivers nonetheless. Black Heroes- Black Panther and Storm are still married in this world (woot) I wonder how he would react upon learning Wolverine killed his lady love? Hmmmmm…. I expect quite a few fans to cry foul that they killed Storm in the opening salvo but let’s be honest she was such a piece of uselessness and a punching bag in the original Avengers Vs X-men and such a token black member of every team in Marvel Now perhaps death will serve her better here. Cover colors- A bit drab especially when you consider how stunning and top quality the Avengers Vs X-men series of covers were. I don’t get why people had a problem with Black Panther and Storm being married.